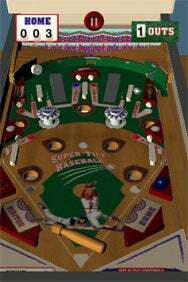 I was looking forward to getting a chance to play Super Tilt-Baseball, a baseball-themed pinball game. Sadly, however, the games kept getting called on account of rain. Or to put it more accurately, bugs—which in the games of iPhone and iPod touch games, is actually more annoying than rain. Take Me Out to the (Pin) Ball Game: Super-Tilt Baseball recreates a vintage baseball pinball machine game, where you try to rack up base hits and score runs. The gray dots on first and second base mean there are two runners on. Developed by Eizon, Super-Tilt Baseball shouldn’t be compared to the likes of Monster Pinball or Wild West Pinball, where the object is to rack up as many points as possible by banging a ball off assorted bumpers, flippers, and targets. Rather, Super-Tilt Baseball looks to recreate the classic baseball pinball machine games you’d find in an old-time pinball hall (or, if you’re lucky to live close enough to one, a pinball museum specializing in vintage games). Instead of points, you’re looking to tally up hits—and runs—by using a bat-shaped paddle to send the pinball flying around a baseball diamond-shaped surface. You tap anywhere on the screen to swing the bat. But be careful—the field is littered with holes, and if the ball drops into one, you’ve just made an out. In a nod to a specific feature of the iPhone platform, the game encourages you to help direct the ball by tilting your iPhone or iPod left or right—the “tilt” in “Super-Tilt Baseball,” as it were. You can play one-, six-, or nine-inning games of pinball with one or two players. (You’ll have to pass your iPhone back and forth if you go the multiplayer route.) The game also lets you play best-of-five and best-of-seven “playoff” series, keeping a running tally of each game’s final score. It sounds like it should be a lot more fun than the actual game turns out to be. In part, that’s because of the aforementioned bugs. When I first started testing Super-Tilt Baseball, at times the ball would brush up against a panel on the right side of the screen… and promptly disappear. I reported the bug to Eizon, which not only responded promptly but fixed it with the Version 1.2 update. (That update also delivered slight improvements to the graphics and the physics of the game.) Unfortunately, that release introduced another bug—this time, when I hit a home run, the ball would similarly disappear from sight. You can quit out of the game, relaunch it, and resume playing as if nothing ever happened, so there is a workaround. But if I have to quit out and relaunch a game just to play it through to its conclusion, after a while, I’m going to stop bothering to relaunch. Even if Eizon were to stamp out all the bugs once and for all, I’m not sure Super-Tilt Baseball would be a pennant contender. Even after the 1.2 update, the game’s physics are still a little wonky. Occasionally, I’ll tap the screen and the bat won’t respond; other times, the bat will swing, but the ball will glance off it, continuing unimpeded on its route to Outs-ville. Gameplay is a little drab, as well—often times, you’ll shoot the pinball, watch it roll toward your bat, tap to swing… and watch helplessly as the ball heads right into a hole, and you’re charged with an out. The much-ballyhooed tilting isn’t much of a help. If anything, I tend to steer the ball into an out with greater alacrity. I’ve noticed that if the ball gets anywhere near the visitor dugout on the left side of the screen, all the tilting in the world won’t keep it from rolling away from my bat and out of play. Super-Tilt Baseball would also benefit from being more clear on how you actually score runs in the game. I get that there are targets scattered around the playing surface that record base hits when you strike them. But sometimes, they’ll be scored as singles, and other times, you’ll score extra base hits—I have no idea as to why and when. An in-game tutorial might alleviate my confusion. There’s a baseball diamond in the middle of the screen, and the bases light up when they’re occupied by runners. But that means they go from dark gray to light gray—a touch of color might make things more visually interesting, not to mention easier to follow. Super-Tilt Baseball isn’t without its charms—the developer really nails the sound effects, particularly the sound of the pinball as it rolls down the wooden surface of play and the roar of the crowd when you smack an all-too-infrequent base hit. But there’s not much else to cheer about with this game. Bugs, inconsistent physics, and monotonous gameplay make Super-Tilt Baseball about as tedious as a late August doubleheader between two cellar dwellers.